Since we changed our internet pages, we have had a stream of enquiries about our new title photo. Where is this idyllic, beautifully-designed garden with its Tuscan flair? 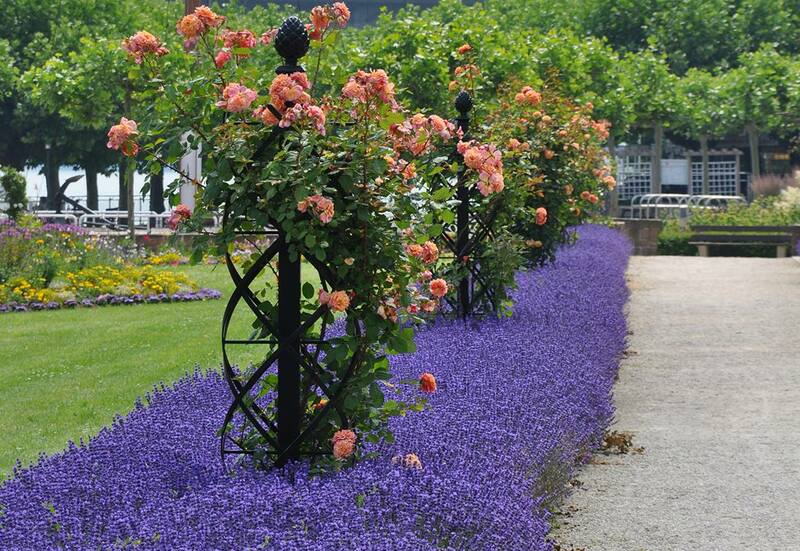 Here we reveal that those rows of flowering ‘Hidcote Blue’ lavender, the ‘Aloha’ climbing roses scaling our Charleston Trellis, and the lawns with well-tended island flowerbeds are all to be found at the Rhine Promenade in the city of Worms. This historical park dating from the 1920s was recently extensively renovated. Its attractive location on the bank of the Rhine and its well-ordered classical layout make it one the city’s finest parks. The park flowerbeds are freshly planted twice a year. In springtime, tulips and pansies dominate the scene while from June it is summer flowers that charm the visitor. The citizens of Worms can take pride in the fact that all of these plants and flowers are sourced in their own civic nurseries. Erich Kulling, an official at the local parks authority, has kindly sent us some truly inviting photos. Enjoy a sea of blooms and the fragrance of lavender. Watch the ships as they pass down the Rhine. Simply unwind. The perfect holiday. On the bank of the Rhine in Worms.